Are you one of those who would love to have a fish tank but unfortunately cannot do so due to a space issue? Well, now you have a solution for that, and it’s called ‘nano aquarium’. Nano aquariums are getting quite popular as they make it easy to own your favourite fishes without getting worried about the space. 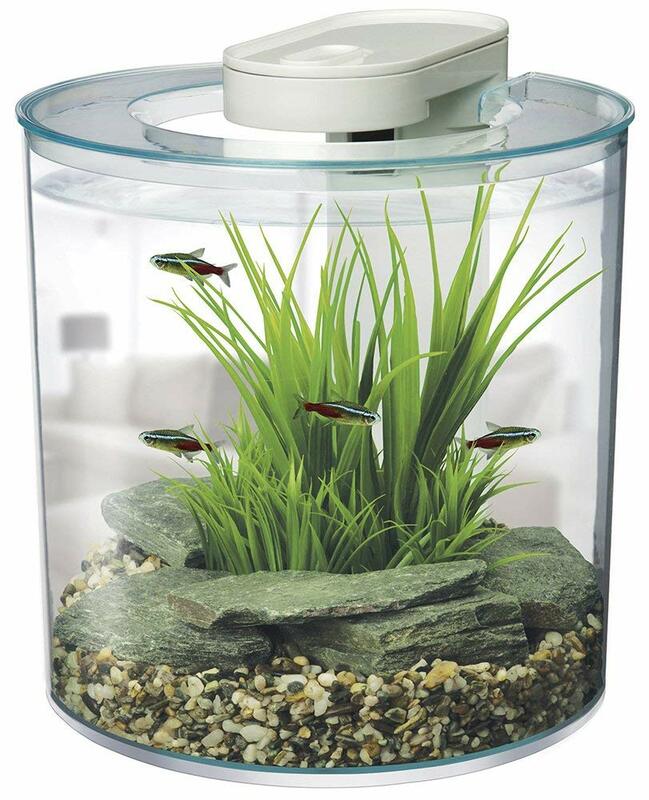 A desktop fish tank contains about 1.5-20 litres of water and is compact enough to be placed on your desktop. It is less expensive, and you end up saving a lot of money because it has very few requirements to set up. These tanks utilise less power and lighting. Also, you wouldn’t need to buy lot substrate materials for such a small tank. Another perk of having a small aquarium for your desktop is that it is effortless to move anywhere as they are very lightweight. Now you can’t do that with a 40inch aquarium. Isn’t it? The maintenance in these desktop aquariums is almost 70% easier than huge tanks. Changing water is extremely easy and doesn’t take much of time. As now you know the advantages of owning a nano aquarium, you must be clear about who could keep these small tanks. These are perfect for an office desktop and even for your home if you are looking for a compact, cost-effective and low-maintenance aquarium. If you are a seasoned pro or inexperienced in keeping aquariums, it can still be tricky to choose the right nano aquarium. What makes this aquarium better than others in the same range is that it is made of Acrylic which is ten times stronger than glass with better transparency and lighter weight. Also, the water line in the tank has been hidden which gives an even better viewing. The round-structured tank has a hinged lid so that you can feed the fishes without any hassle or mess. The feeding hole has been covered with a silicone plug that helps in decreasing evaporation and air exchange. Additionally, there is a magnetic lock for the lid which keeps the tank sealed tightly. The kit comes with the tank, biOrb 12V transformer, air pump, 450 gm ceramic media, filter cartridge and MCR LED lighting system with remote control. The aquarium comes with a multicolour LED lighting system which has 16 pre-set colours. You can also control the brightness as per your preference. The tank uses a 5-stage filtration system which includes- biological, chemical water, mechanical, stabilisation and oxygenation processes. To keep the aquarium in a healthy condition, you will need to change the filter cartridge every four weeks. The bottom of the aquarium has anti-slip mat attachments which keep the tank secure on any surface. 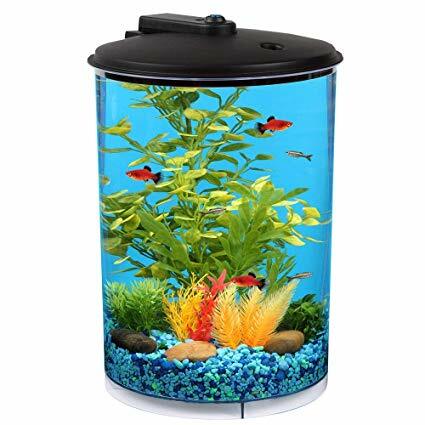 Moreover, the tank comes with a 2-year warranty, so for people who do not have fish keeping experience and are worried about the maintenance; this tank would be the ideal first choice. 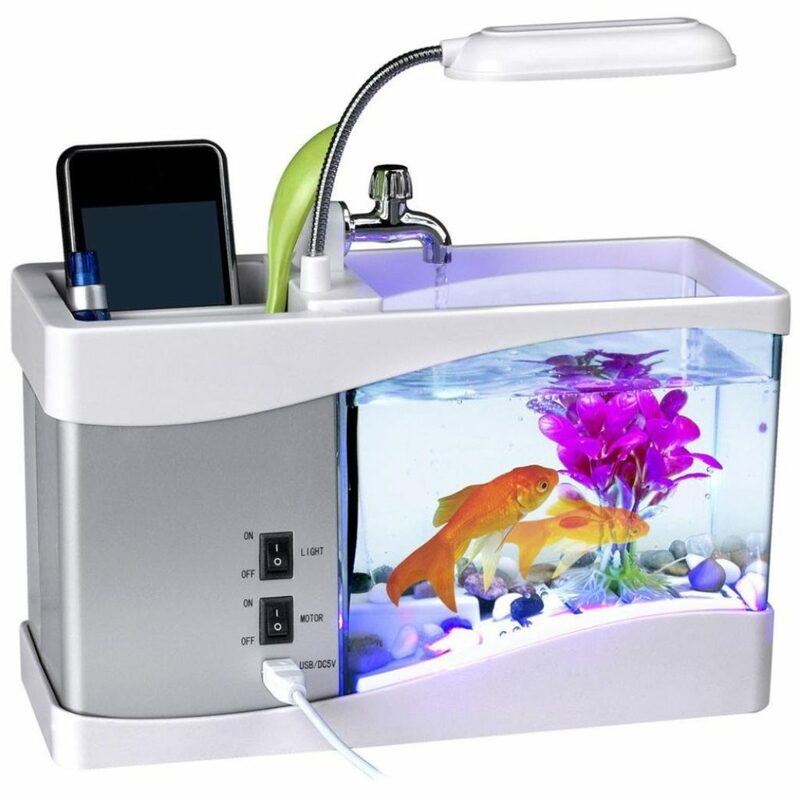 What people like about this small aquarium is its creative design with so many useful functions. This desktop aquarium is perfect for keeping small fishes. It comes with a LED light, artificial plant, small pebbles and decorative gravel. The LED light which has been placed over the tank is adjustable. It also features a USB connector and an LCD screen which displays time, date, calendar and even temperature. The aquarium is made of plastic as the primary material with metal batteries and comes in two colours black and white. It weighs approximately 705g and comes. It is transparent from three sides which gives you a clear view of the fishes. Also, what makes the aquarium stand out are the beautiful multicolour interior LED lights which have been kept at the bottom. You can turn on/off the LED lights with the switches placed in the front of the tank. Altogether there are two colour changing and six white LED lights. The design of the aquarium also features a pen folder with two compartments which can be used to organise the desk. There are various modes of amicable nature sounds such as sounds of birds and frogs. The tank has a capacity of 1.5L of water. The moving water can be activated with USB, once you connect it to your PC or other power sources. This one is a multi-function nano aquarium from CreazyBee which can hold 1.5 litres of water. The tank weighs approximately 700g with dimensions of 24 * 10 * 9.7 cm. This tiny fish tank is ideal for children and beginners who are looking for a low-maintenance aquarium. The water in the aquarium gets re-circulated to keep it oxygenated always. You can simple activate the running water by connecting it to a power source via a USB cable. The tank has multiple colour LED lights which have been placed under the water. These lights come with daylight settings and can be controlled by the on/off switch. It also features various modes of nature’s sounds. The LCD on the aquarium features an alarm clock, calendar, date, time and temperature. The dual overhead compartment in the tank can hold your stationery easily. The kit comes with the tank, decorative pebbles, an artificial plant and a USB connector. This portable nano aquarium is so lightweight that you can manage it where ever you want. The innovatively designed Marina 360 Degree aquarium can hold up to 2.65 gallons of water, and it comes with vagarious features to facilitate the setup and maintenance. The tank has dimensions of 10 x10 inches and weighs approximately 2.2 kgs. The tank has been equipped with a custom LED lighting system. The pump in the tank draws water from the bottom and circulates it to the top in gentle motion which maintains proper water flow. The circular tank gives an unobstructed view from all the angles, and as it occupies minimal space, you can place it on desktops and any other small places. The edges of the plastic are tinted in a light green colour which simulates real glass. You can obliterate the lid to get access to the inside of the tank for cleaning purpose. Also, you can easily remove the housing unit, LED light and filter which are placed at the back of the tank for maintenance. The filter cartridges can collect organic waste and provide biological filtration. This desktop aquarium is a perfect choice for betta fishes and small shrimps. This half moon shaped tank is made of good quality clear plastic and can hold up to 1.1 gallons of water. The tank comes with dimensions of 4.6 x 9.1 x 9.9 inches and weighs around 0.5 kgs. The unique design of the aquarium gives you a clear view of the tank from all the angles. For the first time fish keepers who do not want a high maintenance tank, Tetra LED Half Moon Betta is a perfect choice. 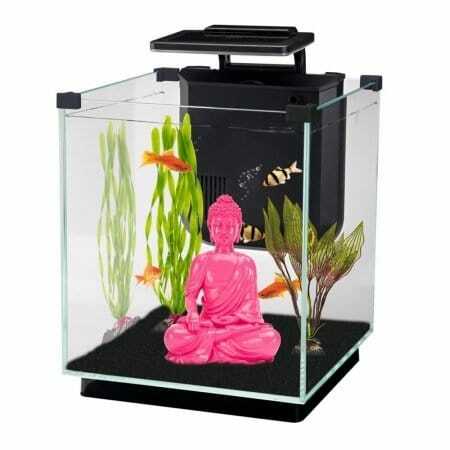 As the name suggests, this tank is ideal for betta fishes because of their small size. There is a hole on the top of the container which makes feeding the fishes very convenient. The cordless LED lighting system uses 3 AA batteries, and you can adjust the lights either above or beneath the tank based on your preference. You can add some gravel and decor to the tank to enhance the overall look. The tank would be perfect for offices, countertops and even a kid’s room. People admire nano aquariums because they are so tiny and beautiful. Along with the right accessories, they can add brilliance to your home or office decor. For this purpose, you can get a head start with the aquarium kit from Kollercraft which has a unique curved design that makes it stand apart from other tanks. The tank has dimensions of 28.6 x 22.2 x 34.3 cm and weighs approximately 907 g which make it easy to move around. This nano aquarium is powered with LED lighting system which has multicolour effects. 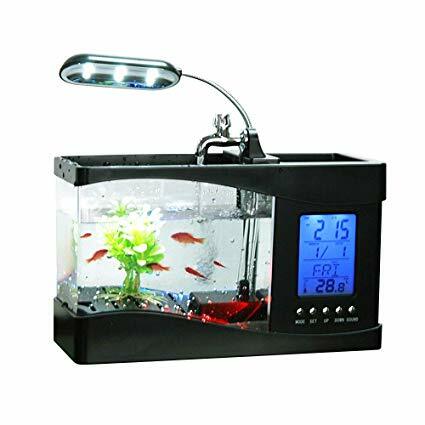 You will get 7 LED colours- aqua, blue, purple, green, red, white and amber; which illuminate the tank brightly and add to the spark of the aquarium. The multiple function lighting system also has a built-in timer and is ideal for providing enough eat to the tank’s inhabitants. This energy efficient tank is also equipped with 10 Internal Power Filter for effective cleaning and purification of water. To add to the filtration process, 10 resin-carbon filter cartridges remove heavy metals, toxic gases, discolouration and odour from the tank effectively. The impact resistant acrylic tank with seamless fabrication is safe for your house, and you don’t have to worry about any crack which usually happens with glued seams. 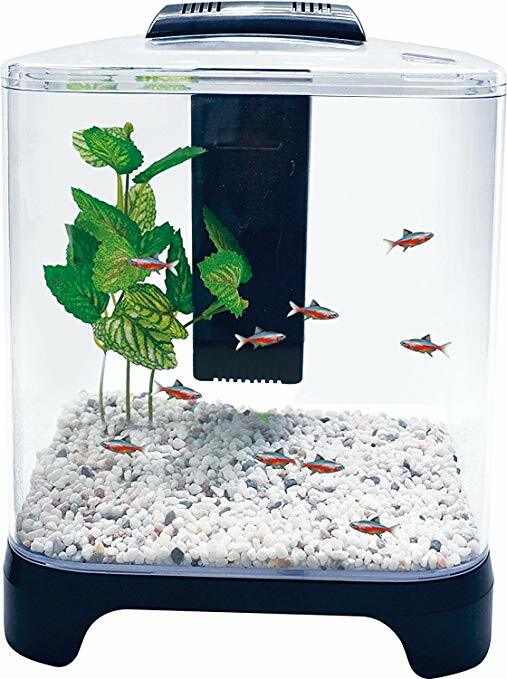 This nano aquarium is quite popular among users and goes out of stock pretty quickly. All together the kit comes with water care products and fish food. So, if you dare brand new to the fantastic world of aquariums, this is the tank that you should buy. Made from supreme quality, clear distortion free glass, this nano aquarium comes in a cube design. What we like about this design mainly is the use of glass as the tank lid which maximises the viewing and light effects. The tank measures 24.1 x 24.1 x 35.6 cm and has a weigh of 5.78 Kg approximately. The tank is designed to hold up to 20 litres of water. Probably the most prominent features of this nano aquarium are the incredible LED lighting system which offers various colour options and has 16 bulbs all together. What makes the LED system even better is the option of high-quality touch control; every time there is a burst of any colour in the tank, it looks glorified. With the daylight and moonlight settings, this tank seems excellent all hours of the day. The internal hang on filtration system makes sure that the container is clear for a longer duration, so that you need to change the water less frequently. All these handy features make this aquarium extremely easy to set up, and it is perfect for children, beginners and even experts. 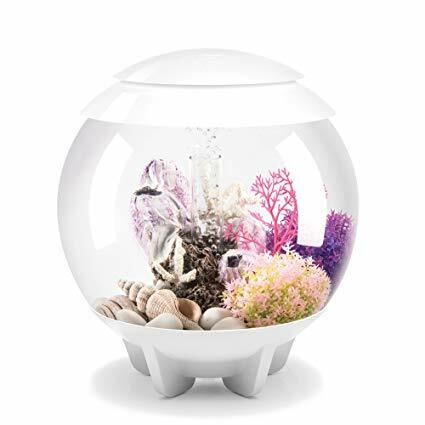 You can also buy aquarium decoration from the same seller who comes in a plethora of variety. 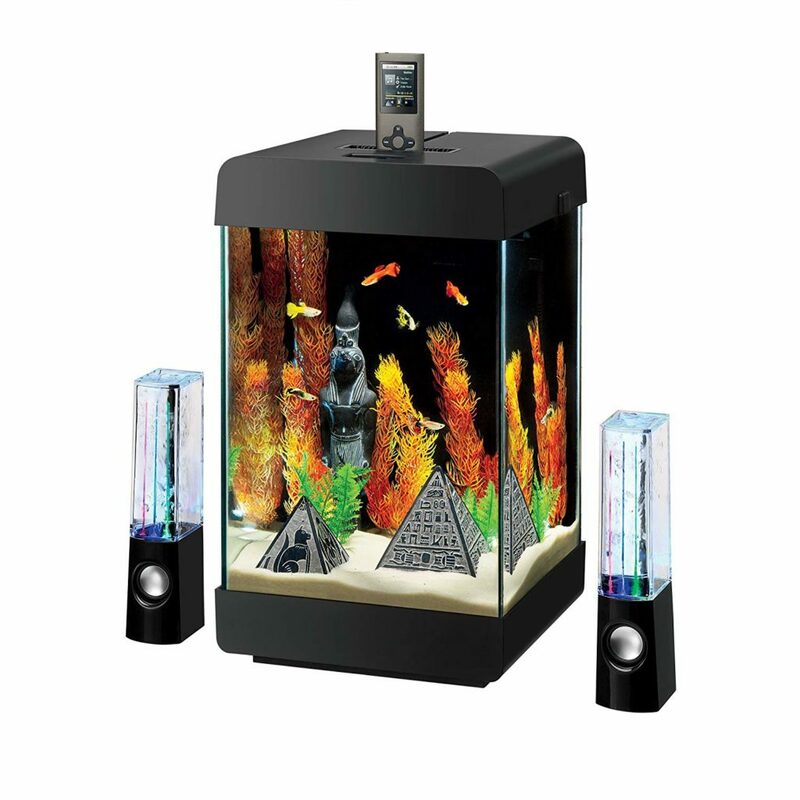 This nano aquarium from Aqueon Jukebox is one of its kinds with contemporary design. The tank comes in dimensions of 23.5 x 24.1 x 43.2 cm with a weight of 4.99 kg. The tank is made of high- quality clear glass and is equipped with LED lights which have both daylight and moonlight settings to add a glow to the aquarium. Probably one of the most stunning features of this tank is the virtually invisible seams as they make the viewing even better. The aquarium comes with standing speakers, which make it really exclusive. You can use USB ports to connect any device with the speakers. 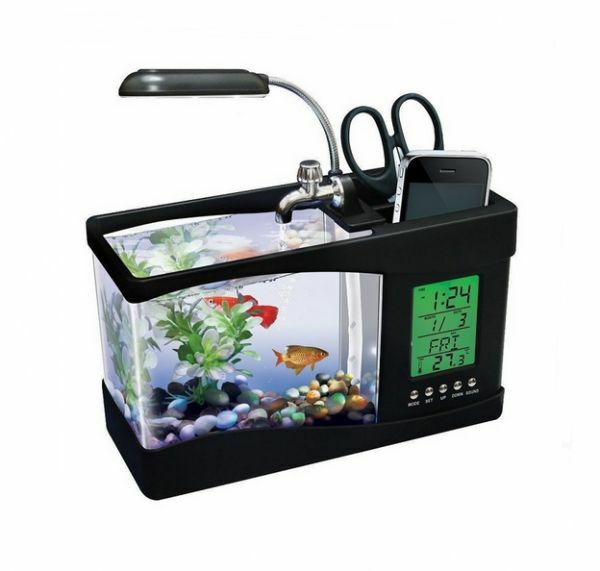 The lid of the aquarium is designed to hold a smartphone or MP3 player. The idea to include speakers with the tank, make this aquarium fun to have for your house and even an office. This kit comes with a setup guide, glass tank, food samples and also water care products. 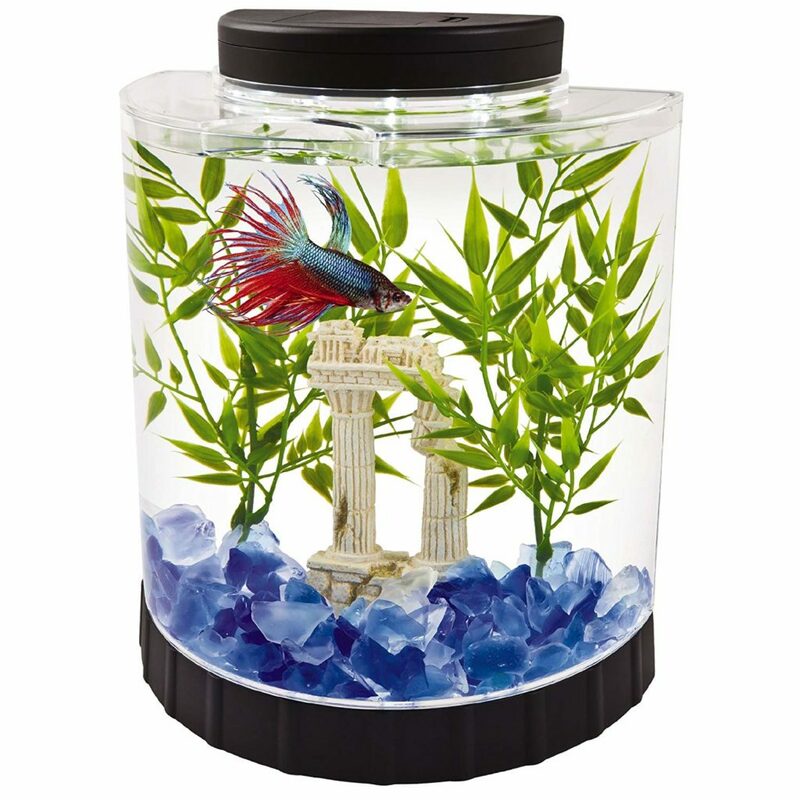 If you love betta fishes, then this aquarium would be the ideal choice for first-time keepers. Another nano aquarium in our top ten list is this tank designed by Penn Plax with a 5.6 litres water capacity. The tank measures 9.5 inches high by x 8.5 wide 6 deep which make its stackable choice for a desktop or table. It has been supplied with a 3-stage filtration technology which uses chemical, mechanical and biological filtration. To add on the cleaning process, carbon media further removes pollutants such as nitrate from the water. This keeps the water clean for longer durations so that the fishes can live stress- free. You can buy gravel and other decorations from the same seller to enhance the look of the aquarium further. 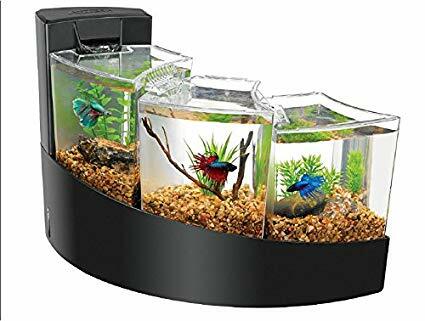 This unique aquarium comes in a contemporary design which is constructed primarily for betta fishes. The tank is in a curved design with three separate compartments with constant a waterfall that adds a stylish statement to the overall looks for the aquarium. The panels are frosted so that the fishes cannot see each other. The aquarium comes in two colours- black and white. The kit comes with a filter, cartridge, water and food samples. The waterfall provides a constant flow of filtered water in the tank, and you get Aqueon’s QuietFlow Filter with the kit which keeps the water healthy for the fishes. You can add the decor of your choices such as rocks, pebbles, stones and small plants to enhance the beauty of the tank. While picking up a subtle nano aquarium, be aware of the specific requirements such as temperature, water quality and filters. We would suggest going for a kit as it includes everything that you would need to set up an aquarium. For a desktop aquarium, always keep small and colourful fishes which are not aggressive. The aquariums listed in this post are pretty good for beginners as well as seasoned hobbyists. Let us know your choice in the comments below.